Rump roast and chuck roast are two delicious, if underrated, cuts of beef. Because both come from heavily-exercised parts of the cow, they contain a lot of tough muscle. However, they are among the most flavorful beef cuts. This article will discuss the difference between the two. The rump roast, also known as the round, comes from a cow’s hindquarters. It contains large amounts of connective tissue and very little fat, making it an extra lean cut. A three-ounce serving of rump roast contains just 139 calories. Rump roasts are best braised or stewed in a Dutch oven or slow cooker. This cut also makes a good oven roast as long as it is cooked slowly on low heat and is thinly sliced before serving. If you get your roast beef from a local deli, chances are, you’re getting a piece of rump roast. The chuck roast comes from a cow’s shoulder. Because the shoulder is heavily used by the cow while moving around, it contains generous amounts of collagen. While chuck roast contains a fair amount of marbling, the USDA classifies it as a lean cut of beef. Thanks to its fat content, a typical three-ounce serving of chuck roast contains 147 calories. As with most lean cuts, chuck roasts come out best when cooked on low heat for a long time. Pot roasts using this cut result in a tender cut with rich drippings perfect for making gravy. Thanks to its unique combination of fat and muscle, most beef sold as “ground beef” comes from the chuck roast. Thus, chuck roast is often found in hamburger patties. Rump roasts come from the cow’s hindquarters. In contrast, chuck roasts come from the cow’s shoulder area. As the rump roast has very little fat, the USDA classifies it as an extra lean cut. The chuck roast contains a generous amount of marbling; despite this, it is classified as a lean cut. A rump roast contains 139 calories per three-ounce serving. A similarly-sized serving of chuck roast contains 147 calories. 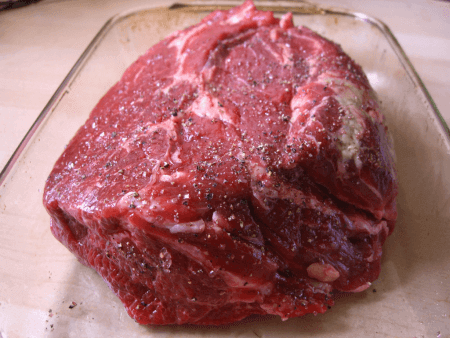 The relatively low fat content and high connective tissue content of both rump roast and chuck roast make them ideal for slow cooking. For rump roast, chefs recommend braising or stewing in a Dutch oven, or oven roasting on low heat. For chuck roast, pot roasting is highly recommended as it preserves the moisture of the meat. 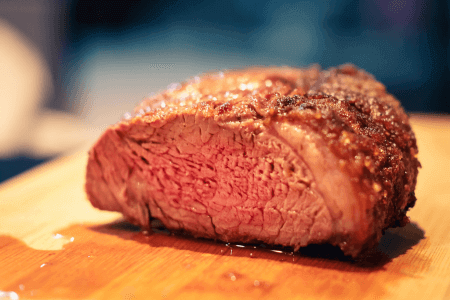 Most delis use rump roast for roast beef, as it is tender if sliced thinly. Chuck roasts are often processed into ground beef and are the primary ingredients in burger patties.